The 2019 Healthy Parks Healthy People Forum will bring together parks and recreation professionals, health professionals, researchers, policy-makers, academics, students, trainees and community members to share the latest research, best practices, and progressive policies related to the human health and well-being benefits of nature. This includes both direct contact with nature and a healthy environment. Healthy Parks Healthy People is a worldwide movement which was launched by Parks Victoria (Australia) in 2000 to encourage the connections between a healthy environment and healthy society. In Canada, both parks and health organizations have recognized this link and launched their own programs. Backed by a growing body of evidence, Healthy Parks Healthy People has expanded and is receiving global attention. The two-day forum will feature a variety of peer-reviewed sessions generated through the Call for Submissions. Explore evidence-based ways that nature can improve human health. Encourage critical dialogue and foster partnerships between the parks, environment, and medical communities. Inspire people to take action to incorporate nature into health programming. Articulate the current status of research, policy, and practice related to healthy communities and public green space. Identify public health challenges and related solutions, trends, emerging issues, and gaps. Utilize effective evidence-based public health programs, practices, structures, and systems. Anyone interested in the linkages between human health and nature, and interested in taking action to use nature as a tool to improve health outcomes, should attend this forum. 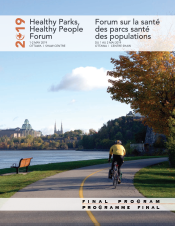 The 2019 Healthy Parks, Healthy People Forum is held concurrently with Public Health 2019, take advantage of discounts available for travel and accommodations in Ottawa.